The LUXeXceL Group in the Netherlands has announced both the launch of a new additive manufacturing platform that delivers high speed and precision as well as the introduction of a new clear material LUX-Opticlear, which allows high quality optics manufacturing up to 20 mm in height. With these new capabilities, the LUXeXceL process is ready to compete with injection molding for the production of small and mid-sized series of optical components. The company now offers a fast and effective service for prototyping, iterating and the manufacturing of optics, cutting out the need for costly and inflexible tooling. The whole process is digital, allowing full flexibility and ordering on demand. This means that large inventory costs are no longer necessary. Small series or individual optics can be made in the space of a few days. Unique optical designs and components can be quickly tested and new designs can be validated. Adding up all these advantages in one single manufacturing service, LUXeXceL is now offering the full package to take on injection molding for small and mid-sized series. 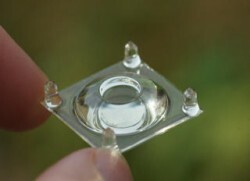 The new material, LUX-Opticlear, was developed by LUXeXceL to offer the best optical properties with a print height up to 20 mm. This new material is the first of many more developments in the world of optical components. LUXeXceL’s new online platform will be rolled out over the rest of 2014. It will allow for the uploading of CAD files to a personal and secure part of the platform. It will provide the customer with a quotation for the production of the 3-D file based on the specifications. This process will be at your disposal 24/7.